Cheese lovers might be surprised to find a farmstead cheesemaker in the rolling hills and winding roads of Madison County. I certainly was because when I tapped my breaks as I noticed the Oakvale sign, I had completely forgotten about the pick up truck tailgating me. He moved on but I stayed behind to investigate. I have tried Oakvale cheese at many farm markets and events at the Hills Market over the last couple years but I never placed where the Oakvale was in my mind. Fortunately for me, they were open and I happened to catch Jean King in between chores. Jean and her husband Dale along with their daughter Dena, Randy Finke and the family dog run the cheese operation at the King farm. The family has been in the dairy business for five generations. As a farmstead cheese maker the milk for the cheese comes from the cows of the area which are mostly Holsteins and Brown Swiss cows. The cows eat local corn and graze on pastures near the farm. 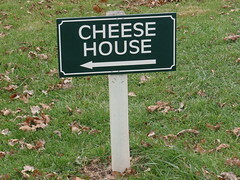 The cheese making process can begin hours after milking. Tudy is the senior cow of the herd and has been on the King farm for over 17 years. Oakvale makes Gouda cheese in the following varieties: young, aged, caraway, Jalapeno and Habanero. They are also starting to work on smoked cheese and other products. The cheese is made with raw milk and aged 60 days (or more). Tours are available of the facility by arrangement. If you arrive and no one is around, you can self serve your order and pay when you leave. Jean says this honor system has worked very well and in some cases she has had wonderful thank you notes written by customers she has never seen. On December 4th and 5th, Oakvale is having an open house where visitors can see everything in action, sample cheese and get 20% off all cheese purchases. It is a rare opportunity to buy cheese at the home of the people and cows that make it possible so make the drive and stock up of the holidays. 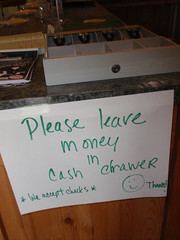 This entry was posted on November 19, 2009 at 9:23 PM	and is filed under cheese, Road Trip. 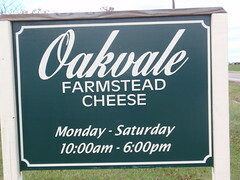 Tagged: Oakvale Farmstead Cheese. You can follow any responses to this entry through the RSS 2.0 feed. You can leave a response, or trackback from your own site. Thank you for writing about this! Karl and I will try to stop there on the way out of town for Thanksgiving. I guess you don’t get Swiss cheese from Swiss cows? Is this south or north of I-70? I love to find local cheeses, thanks for the insight.